Copied shamelessly from The Boston Globe, sometime in early October, 1997, from the Ask the Globe section. Q. I have heard that there is a lake in Massachusetts with a long name which means "you fish on your side, I fish on mine, nobody fishes in the middle." True or false? If true, where is the lake? A. True. Lake Chargoggagoggmanchoggagogg is a 17-mile-around lake in Webster. (Some sources offer this spelling: Chargoggagoggmanchauggagoggchaubunagungamaugg). The original name of the lake as it appears in ancient deeds was Chabanakongkomom, with fewer letters and easier to pronounce. 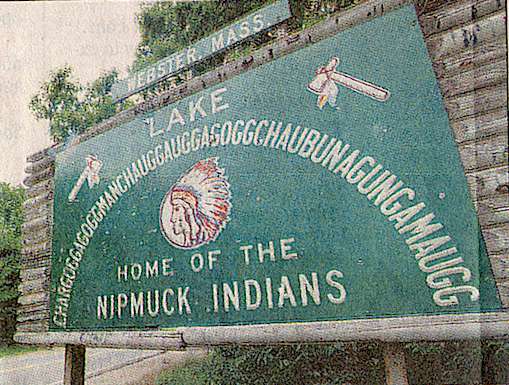 The Nipmuks gave the body of water this name because it was neutral territory and a favored site for powwows among their tribe and the Narraganssett, Pequot and Mohegan tribes. 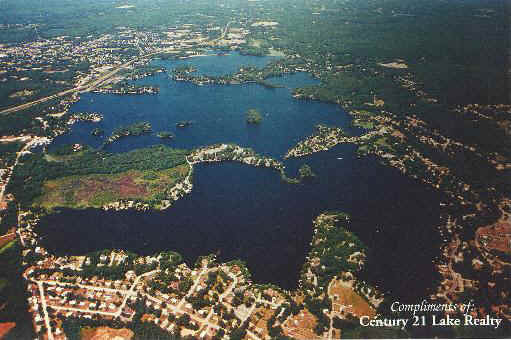 Residents of Webster have shortened the name, understandably, to Lake Manchaug. "I believe in Moderation in all things. ESPECIALLY Moderation." which has a tad more information and a cool picture. It's by the Webster Police department. In fact, here's some pictures that I found on the net, including the one from the Webster Police department.